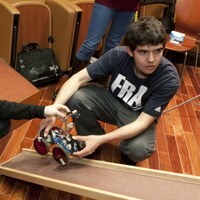 David Orozco '12 was unsure how his team's car would perform after a crucial part shattered. Despite having only front-wheel drive, however, the car had little trouble scaling the ramp onto the track, made three laps, and earned a respectable 110 points. Down one wheel but still going strong, Team Nemo completed a U-turn and prepared to tackle the mountainous pipes. Dan Bruder '12 (left) and Michael Lukas '14 (second from right) held the control cable while visiting lecturers Barry Griffin '71 and Conor Walsh looked on. Undergraduates in Engineering Sciences 51, "Computer-Aided Machine Design," had spent a semester learning to design gadgets in SolidWorks, building candy-flinging catapults, and mastering the use of the soldering iron. Then came the jaw-dropping final assignment: "Transform a cordless power screwdriver into a functional all-terrain vehicle." The students were given a small kit of extra materials, including gears, screws, and wheels, beyond the three allotted screwdrivers, but—five weeks from start to finish—this do-it-yourself construction project was no LEGO® Technic set. "The goal is to teach them the basics of design," said Neil Tenenholtz, a second-year graduate student and teaching fellow for the course, who was helping students assemble chassis and controllers in the lab. "Until this point in the class, we'd give them a design and say, 'Go make this.' Now we'll see if they can put the two parts together." "We teach them in class about gears and screws," Tenenholtz said, "but getting two gears to mesh well in practice? You don't realize how hard that is until you apply it." Colin Saintangelo '11 (left) and Sam Wald '11 (right) assembled their tank threads, while Barry McKenna '14 (center) perfected his chassis. Adding to the rigor of the assignment, Conor Walsh, a Visiting Lecturer who teaches the course this semester, specified that the cars had to meet strict design, manufacturing, and performance requirements. Each of the four teams had to produce concept sketches, a foam-core prototype, and a complete computer model using SolidWorks graphics software. Then, in manufacturing components like the chassis and the motor mount, he said, the teams had to use CNC milling, laser cutting, and 3D printing at least once. 1. Drive up a steep ramp while carrying or towing a heavy block of lead. 2. Enter the track and traverse a rocky field of circuit board rubble. 3. Drive in a straight line through a tight tunnel (open at the top to allow the control wires to pass through). 5. Climb over a series of half-pipe bumps without getting stuck or flipping over. 6. Wind through a slalom of vertical posts. Team VAS (Lowell Fluke '14, Jason Michas '13, Colin Saintangelo '11, and Sam Wald '11) took an unusual approach. They modeled their vehicle after a tank, with a low center of gravity and caterpillar tracks. With a tight turning radius and a high degree of stability, their tank proved to be the most maneuverable. Though it wasn't able to generate enough traction to pull the lead block up the initial ramp, it set the lap record in the final contest and earned the team 275 points. Damien Pietrus '14 drove his team's car toward the circuit board rubble, while Juliana Cherston '13 held the control cable out of its path. Team Stingray (Damien Pietrus '14, Juliana Cherston '13, and Will Burke '13) had originally designed their diamond-shaped car with four wheels—one at the front, one at the back, and two on the sides. When they tested a prototype on the pipes, though, they found that the front wheel lifted off the ground, leaving the two side wheels unbalanced and unstable. The car was difficult to steer, too. "We had to redesign in the middle of the project, so that was a learning process," said Cherston. "Things don't always go as planned." The team reduced their design to three wheels and adjusted the balance. In the final contest, the rear, unpowered wheel skidded from time to time, but the car was a winner. It was the first vehicle to successfully carry the lead block up the ramp, and it raced around the track with ease, racking up 395 points. Their classmates on Team Nemo (Terrence Barry McKenna '14, Dan Bruder '12, Michael Lukas '14, and Amelia Lin '11) had struggled with the lead block in early tests, as their car had a tendency to tip forward and lose traction in the back wheels. Amelia Lin '11 watched with bated breath to see if her team's car would maintain enough traction to reach the track. The team found that lighter is not always better, as McKenna explained to the class before taking the controls. "We had to redesign most things as we went," he said. His team had first experimented with adjustments to the weight and balance of their car but eventually reached a compromise that used gravity to their advantage. In the final design, when the car reached the top of the ramp, it tipped forward to release the lead block, but a sort of plastic kick stand on the front of the car prevented it from flipping completely. Team Nemo's car elicited gasps from classmates crowded around the track when it lost a wheel while exiting the tunnel, teetered on the edge of the track while performing the U-turn, and wedged itself between two of the slalom posts. Each time, though, it recovered to enthusiastic applause. All four teams extolled the lessons they had learned: the value of a strong initial design; the importance of testing a prototype; the art of soldering a connection without burning one's fingers; and the sheer amount of time it takes to carry a project from design to completion. Perhaps the lesson of the day, though, was perseverance. When Team Hot Wheels (Laura Freeman '12, Brandon Hopkins '11, and David Orozco '12) arrived at Pierce Hall on competition night, they were in low spirits. Just five minutes before, a critical acrylic panel that was holding the gear train for the rear wheels had shattered. Short on time and options, they had hot-glued it back together but couldn't get the car to run successfully for more than a few seconds. Brandon Hopkins '11 (left) and David Orozco '12 did not expect their car to perform so well. Despite an ingenious initial design—their car featured a central hinge that vastly improved its stability and steering—the team didn't expect the car with a broken piece to complete even the first challenge. "Just rip it off," suggested Tenenholtz, as the contest timer counted down. "You have one minute." Under great pressure and suspense, the team removed the components that powered the rear wheels. Despite having only front-wheel drive, the car did, in fact, scale the ramp. It also completed almost three full laps of the track before the timer ran out, and earned the team a respectable 110 points. "We set these students a high target, and they all rose to the occasion," said Walsh. "They became better designers and hopefully had some fun along the way too." "Design is different than many other engineering disciplines, and all of our students learned that it requires a high level of persistence," he said. "But the energy in the room tonight showed that the rewards can be extremely energizing."